We’ve been up to all kinds of things lately— good, bad, and terrifying—so I thought I’d do a bit of a roundup. Monday was the ALA Youth Media Awards (Newbery, Caldecott, Printz, and so on), so my former colleague, Danielle, and her four-month-old, Harper, came to see me at work so that we could watch the webcast together. Since it was Harper’s first awards season, her tastes were not quite as refined as Danielle’s and mine, but we all cheered and booed appropriately nonetheless. Harper particularly enjoyed any opportunities to grin and show off her first two teeth. As far as the awards go, I think our Mock Newbery and Mock Printz clubs at the libraries did a better job. John Green was thoroughly dissed, and some of the choices were rather obscure, but we were generally happy. Tuesday was a truly rugged dentist’s appointment. I was in the chair for three hours having a temporary, much-too-old crown removed and replaced with a lovely new one. At one point, I was shocked to find that the burning smell that was worrying me was coming from my mouth. My dentist looks like a movie star, and his assistant is a down-home girl. When I came in, she was already deep into a tractor show on the History Channel. In my three-hour stint, I learned how to pull a tractor, the history and workings of a Lamborghini, and that your father’s Woody Woodpecker toy is worth something at the Antiques Road Show. I also found out that there are people who are so deranged that they will allow themselves to be closed into a car that is then sealed into a plastic bag and pumped full of teargas. This is to find out whether the car is truly airtight. I guess if you die, your car wins. David spent Tuesday repairing his brakes, which went out on his trip back from a home showing one hour away. He drove home the whole way without brakes. I knew that the Lord woke me up to pray for him for a reason the night before this trip. He is alive and well! And has brakes. And a contract on the house. This morning, I went to my doctor, whom I love even though she gave me a flu shot. My cholesterol is 164! Bad cholesterol is way down, triglycerides at 94. We are happy. Still testing at-risk for diabetes, but not diabetic. She approves the low-carb diet and exercise, and believes that my diabetes is being reversed. This was a much better morning than yesterday. After my four adult nonfiction books, I went on to read a new children’s bio called Temple Grandin: How the Girl Who Loved Cows Embraced Autism and Changed the World, by Sy Montgomery. If you don’t know Temple Grandin, you should. She is an inspiration. She was born before anyone knew anything about autism, and her wealthy father was so distressed that his daughter was less than perfect that he wanted her to be committed to an institution. Her mother was extremely courageous and fought even her doctor by keeping Temple at home, hiring speech therapists and psychologists, and then getting her into a mainstream school. Today, Temple Grandin has a Ph.D. in animal behavior and has designed the more humane procedures now used in over 50% of meat-packing plants. She did this at a time when no one cared about animal cruelty, no one believed anything a woman had to say, and no one had ever dealt with an autistic adult before. The book is terrific for kids, especially kids with autism, and is a great introduction for adults. The HBO movie of her life, which she talks about in the book, starred Claire Danes and won a pile of awards. That was my introduction to her life, and you would love it. Temple herself has had a great deal of participation in both of these projects and is very interested in helping everyone to understand autism and animal husbandry. She is the only person to have won awards from both PETA and the American Meat Institute. David and I have now torn through seasons one and two of Parenthood, which my sister lent us on DVD. Season 3, disc 1 arrived from Netflix today. If you have not been watching Parenthood, allow me to introduce you to your new friends, the Braverman family: four grown siblings, two sisters and two brothers. They all have kids, and they and their parents all live near each other (which is convenient for filming). It all sounds just too twee, but it’s not. Some are control freaks, some are free spirits, two are married, two not. There are teenagers, so that’s another layer of stress and complications. Sometimes they all get along, but there are all sorts of plots and subplots to pull them apart and bring them back together. If you have siblings or parents or kids, you will see yourself in at least one or two of them. David and I find ourselves talking about them as if they were our crazy relatives and we can’t believe some of the choices they’ve made. Totally absorbing. It’s in its fourth season live right now. One of the elements of Parenthood that I really appreciate is the fabulous music. Lucy Schwartz does the theme song, which I love and can sing to you by heart. Even more so, I have become a big fan of Ray LaMontagne, whose song “Let It Be Me” played during a particularly touching scene. I jumped up and found a website that lists every song on every episode, then went to Grooveshark and played this one in full. I was a sobbing fool. All of his songs are bluesy and mellow, so if I played him and Norah Jones back to back while driving, I would probably fall asleep at the wheel. However, if you like that sort of thing, give him a listen! I guess that’s it! We’re trying to get our taxes filed tomorrow, since real estate is sorta slack in midwinter. So, back to the calculator for me! Teal Tracking 2: 35 Pounds Down! Yes, we have lost 35 pounds, but I have lost 15 and David has lost 20! Is that fair? Men are so lucky; their metabolisms are so much faster than women’s. Plus, David has a little ace in the hole: he just started on some ADHD medication, which suppresses his appetite. A few days ago, we were about halfway through dinner when he said, “I’m full. I think I’ll wrap this up for tomorrow.” I stared at him in wonder. He had never stopped eating in the middle of his first helping before, and I didn’t even know he realized that you could wrap up food for tomorrow. It’s a strange new world. In a follow-up to last week’s book discussion, leaving long periods of time between each day’s food, as in The 8-Hour Diet (really ten hours for me), seems to work well, as does getting a full night’s sleep. I’ll keep you posted. We’re still walking every day, but as I said to a co-worker last week, it’s still not a habit. I know because I don’t do it without thinking. I have to talk myself into it every day. That means that I do not have a habit of exercise more than two months after I started walking daily. (I started in November walking outside, before we got the treadmill.) Since I’ve seen so many books and magazine articles saying “30 Days to a Perfect You,” I thought I should see why this was not happening. Can Do to Get More of It, by Kelly McGonigal, Ph.D. The book grew out of a course that McGonigal teaches at Stanford University, and is laid out in a very practical manner. After a chunk of instruction, there is a box with exercises for you to complete in your own life. Each chapter is neatly summarized at the end, and her writing is very logical and engaging. Ms. McGonigal spends some time touring you around the prefrontal cortex, pointing out the areas for “I will,” “I won’t,” and “I want.” These are the three components of willpower, with the “I want” being your long-term goal, and the others being your quick or habitual responses. She points out that jumping toward whatever you want is not a bad thing, unless the thing you want is a bad thing. If it’s the very last awesome deal on Black Friday, good for you. If you get home and find out that you have absolutely no use for a pair of purple shoes that don’t fit anyone you can think of, perhaps you should have paused. That’s her key phrase: “Pause and plan.” When tempted, think of your long-term goals and how this action will affect them. This reminds me of Stephen Covey’s very wise teaching: Humans do not have to live like rats, stimulus-response. Humans are the only creatures who can see that there is a gap between the stimulus and the response, and can take the opportunity to make a different choice during the gap. As he says, the success or failure of your life takes place in the gaps. McGonigal brings up some interesting phenomena, such as “rebound irony.” Scientists gathered a group of people in a room and told them not to think of white bears. What do you think they couldn’t keep out of their minds? Not only did they think of white bears, but if they tried to force themselves to think of something else, a different part of their brain started a scanning program, looking to see if they were really thinking about white bears. McGonigal says to allow yourself to think about your temptation, even experiencing the feelings that you have about it, but to act rationally. Both the Willpower book and the next book talk about self-control as a muscle that wears out as you use it. If you just struggled with one temptation, you are not stronger immediately, but rather more likely to give in to the next one. Stress lowers self-control, as does a lack of sleep. She also talks about how one small failure can cause us to give in completely, such as being so upset that you ate one piece of cake that you figure you may as well eat the whole cake. She counsels you to pause and think rationally about your long-term goal. Interestingly, she says that people who assign a moral value to a temptation that has no moral component begin to feel that they are a good/bad person, and they dole out rewards and punishments for themselves. For example, “I babysat for a neighbor’s kids for two hours, so I deserve a cigarette.” Not only does it not make sense, but it sabotages your long-term goals. Self-awareness is essential to reaching those goals. The Willpower Instinct is a practical, helpful guide, no matter what sort of challenges you’re dealing with in your life. Secondly, I read the brand-new Making Habits, Breaking Habits: Why We Do Things, Why We Don’t, and How to Make Any Change Stick, by Jeremy Dean. The first two sections of this book are somewhat more abstract than Willpower Instinct, but also more in-depth. The third section is quite practical. Mr. Dean begins by telling us what habits are and why it is practically impossible to break them or make new ones. After this encouraging beginning, he tells us the secrets of those who have succeeded, and how maybe, if you are an exceptional person and work very hard, you might change one or two. 1) They are automatic. No thinking required. For example, during a power outage, if you walk into your dark bathroom, your hand will flip the light switch anyway. It’s as if your hand is working for someone else. 2) They have no emotional content. If you are crying while you’re brushing your teeth, it’s not because your toothpaste is tragic. It’s more likely that you are listening to sad music or thinking about something else. 3) They are situational. The environment you’re in or the time of day triggers a habit. If you wake up, you begin the trek to the shower. When you’re in your car, you drive to work. Most people can’t remember much about their drive in, because their bodies drove while their minds were far away. Both of these books use the fascinating phrase, “cognitive miser.” I was talking to my MBA-student son yesterday, and he used the same phrase! It means that there is only so much brain power to use at any one time, so we shuffle whatever is possible to auto-pilot so that we can use our conscious brains for the problems at hand. Think about it: When you go grocery shopping, do you look at all of the choices every time you buy a jar of peanut butter? Do you compare taste claims, ingredient lists, and price per unit? Of course not! If you did this for every single product every time you went to the store, you’d never get out of there! Plus, you’d be completely exhausted. Usually, people have made a decision on a product long ago, and they continue to pick the same brand for years. This is a problem for marketers. This same concept carries over to your entire life, such as if your household habits were established when you had four little kids and your youngest just graduated from college. They just don’t make sense any more, but they’re ingrained. The best time to make a change is when your life has had a major upheaval: you got married, you changed jobs, or you “moved house,” as the British Mr. Dean would say. You just had your habits severed, so before you lock in new ones, make some plans! Perhaps the most insightful teaching I gleaned from Making Habits, Breaking Habits was that— contrary to what many “experts” advise— people who fantasize about being exactly the way they want to be usually fail. That’s because, emotionally, they have already arrived at their goals and are then devastated by the reality of the long road ahead of them. Rather, Mr. Dean counsels, visualize the path to your goal, with all of its possible pitfalls, and work at solving those problems before you get there. You can create statements for yourself, such as, “If [blank] happens, I will deal with it by [blank].” That way, you will not be surprised, and you will already have a plan in place. He advises taking one small step at a time, not a complete life makeover all at once. I enjoyed both of these books. Although they dealt with related topics, there was just a little overlap, and both relied heavily on scientific research. As Mr. Dean says, scientists can be heard to mutter, “The plural of anecdote is not data.” Indeed. Check ‘em out! Both books should be available in your local library or at all fine retailers. Teal Tracking, Part 1: 25 Pounds Down! See, this is where you need a really big, really fat family, so that you can say, “We’ve Lost 500 Pounds!” and land on the cover of the National Enquirer. Unfortunately, only two of the three of us are even participating, and even though we do have plenty to lose, if we lost 500 pounds, we’d be dead. We are happy with what we’ve accomplished, though, and I’d be glad to share what we’re doing with you because I know how thrilling it is to hear about other people’s diets. Zzzzz. 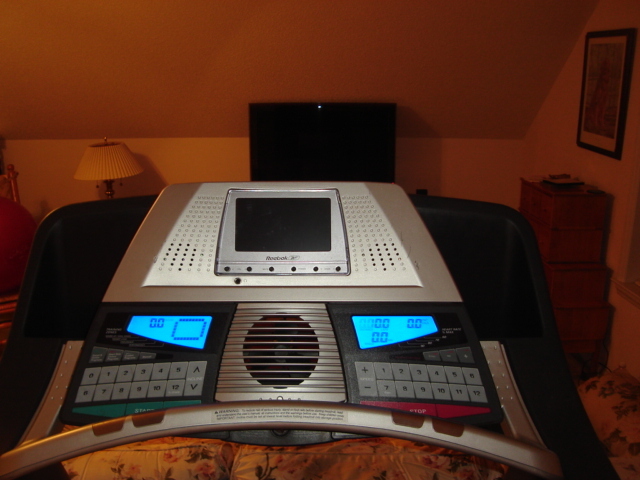 It’s the treadmill! Yes, this is also part one of the Treadmill Chronicles. David and I have both successfully figured out how to use a treadmill without flying off the end screaming (which actually happened to a toddler at our house in Kentucky). If we did fly off the end of this one, we’d hit a dormer window, which would be very uncomfortable. Long ago, my doctor said that 20 minutes per day is the minimum needed to affect blood pressure, so I walk one mile per day—about 25-27 minutes, depending on how fast I go. I have found that increasing the incline as time goes on is very effective. I’ve gotten up to a 5% incline at the peak of the workout. David really enjoys punching in random preprogrammed workouts, all of which last for 30 minutes. He likes not knowing where he’s going or what will happen. You can hear him calling out, “Oh, yeah! Up that hill!” I, on the other hand, enjoy a very preplanned life. No surprises, thank you. Just having a daily exercise time is a new habit that we are both trying to build. Other than that, we haven’t changed what we eat—since we already ate a low-carb diet—but we do pay attention to when and how much. We eat smaller portions and never eat after dinner. That’s it! David has lost 14 pounds and I’ve lost 12. Yay! Of course, nothing happens in my life without reading material, and January is always filled with new books about diet, exercise, and resolutions. I’ve found several that I’m working through, and I’ll tell you about a few of them here. I still have some to go, so expect to see reviews in the future! The first one I read was The End of Diabetes, by Joel Fuhrman, M.D., author of Eat to Live. Here’s the gist: Dr. Fuhrman wants you to be a vegan. Wait! Don’t stop reading! There’s more! Since nearly 12% of American adults have diabetes now, and another 35% are pre-diabetic, researchers predict that more than 33% of American adults will have diabetes by 2050. (Page 1!) It is very heartening to me to see that the truly responsible and scientific (i.e., NOT sponsored by the American Diabetes Association) writers these days are saying that diabetes can be reversed, not just managed. All of them agree that reducing carbohydrates, particularly refined carbohydrates, is the first key. Dr. Fuhrman further argues that lowering fat and calories is essential. He wants you to cut out meat entirely, except perhaps fish once or twice a week, and makes the mistake of conflating all low-carbohydrate diets with the Atkins Diet. He consistently says “low-carbohydrate, high-protein diets.” I remember the first time I went on a low-carb diet. My doctor in Kentucky ranted on and on about high-protein diets. I had no idea what he was talking about. I don’t think that most low-carbers are consciously adding protein to their lives, although it is true that when you take out junk food, good protein does make up a larger proportion of your calories. Surprisingly, Fuhrman has some strong criticism for vegetarians and vegans who fill in all of their non-meat calories with junk carbohydrates, which is why one sees all of those pale, prematurely-aged vegans in health food stores. Personally, I am going to put my canine teeth to good use, but Dr. Fuhrman had some very interesting research and information that made the book worthwhile. First of all, he is right that we should be getting more of our calories from fresh vegetables. That is what is not getting across to most new low-carbers, who are busy looking for substitutes for their old favorites. Michael Pollan had some great advice: “Eat food, not too much, mostly plants.” That is his advice for good health, and it works. Dr. Fuhrman has some fascinating research into particular foods, such as nuts and seeds preventing heart disease in chapter seven, and cruciferous vegetables and greens fighting cancer in chapter eight. Good reading. Just as I was reading Fuhrman’s revolutionary advice on timing meals in this book, I saw David Zinczenko on a talk show giving the same advice from his new book, The 8-Hour Diet. I have not read this book, but when it arrived at the library, we all laughed and said that staying on a diet for eight hours was a truly achievable goal. Of course, that’s not what he’s saying. Both Fuhrman and Zinczenko believe that you should have a long space between meals. Fuhrman just says not to snack and not to eat after dinner, but Zinczenko recommends eating all of your food within eight hours each day, and then not eating for sixteen hours. This is the exact opposite of what most doctors— and certainly the ADA— say to diabetics. They teach patients to eat many small meals all day and not to leave too much time between snacks, hoping to even out your blood sugar. However, if you are not eating foods that raise your blood sugar, you won’t have terrible hypoglycemic crashes if you go for a long time without eating. That has been one of the best results of staying low-carb for me. Zinczenko says that your digestive tract needs to rest and have time to detoxify, and Dr. Fuhrman takes it further by saying that diabetics need to rest the pancreas, allowing Type 2 diabetics to safeguard the few beta cells that they have left. They and many other scientists today cite the recent sleep research that shows that the last two hours of sleep are when your body loses weight by clearing out toxins from the body. If our recent experience of not eating after dinner is any indication, long periods of time without eating is certainly the better idea. The next book I read was The Wheat Belly Cookbook, by William Davis, M.D. If, like me, you did not make it through all of the scientific research in Wheat Belly, you will be happy to know that the first 90 pages of this book are like a Reader’s Digest Condensed version of the earlier work. Davis is on a tear here. He is so angry at the American Diabetes Association and the entire government-sponsored Standard American Diet that is killing so many people. To which I say, “Finally! Preach it!” He makes no bones about pointing out that the biggest sponsor of the ADA is Cadbury Schweppes. Seriously. The other sponsors are diabetes medication manufacturers. Now, what motivation could these sponsors possibly have for preventing or reversing diabetes, when their bottom line is improved by keeping people a little bit sick and increasingly medicated? Reading widely is more essential than ever when the federal government will now have greater control over our health care, and we can see how they’ve been doing so far. Imagine if you had no other information about your health conditions and were forced to abide by the government recommendations or your care would be rationed. Read. Oh, yes, this is a cookbook. There are 150 recipes that look absolutely fabulous. We’re talking real food and low carbohydrates. I made the Wheat-Free Pancakes this morning for breakfast, and we loved them. The recipe makes a ton of them, and they are really filling, so I think I’ll make a (natural) peanut butter and (fruit-only) jelly sandwich with two of them for lunch tomorrow. 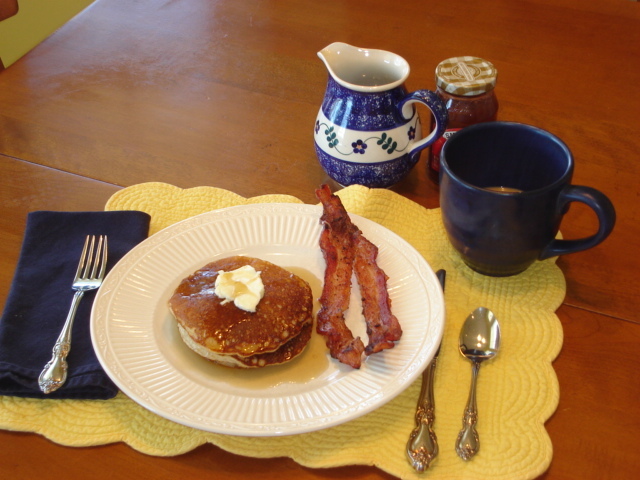 Here is our breakfast this morning, including Wright’s bacon (once a week and we still lose weight) and Maple Grove Farms sugar-free syrup. We put the syrup in my cute, little German pitcher (a gift from a friend) and heat it in the microwave for a bit. I have found that the trick to almond flour pancakes is a nonstick griddle. Don’t try this in a regular skillet, as the pancakes are delicate and will tear apart easily. My next group of books is about building good habits (also very Januaryish), and I’ll let you know about them soon. Right now, I’m reading The Willpower Instinct, by Kelly McGonigal, and then I’ll start the big-buzz new book Making Habits, Breaking Habits, by Jeremy Dean. I also picked up The Unapologetic Fat Girl’s Guide to Exercise: And Other Incendiary Acts, by Hanne Blank, which should be experienced just for the extremely motivational cover. Pics to come. Stay tuned! Fourteen-year-old Sophronia Temminick drives her proper Victorian mother crazy. What with a household full of children and Sophronia falling out of dumbwaiters into the guests’ trifle, Mumsy packs her off to finishing school. But Mademoiselle Geraldine’s Finishing Academy for Young Ladies of Quality is not quite what one would expect of such an establishment. There are classes on deceit and deception, instructions on how to use hair accessories as lethal weapons against supernaturals, and demonstrations of how to use one’s décolletage to conceal secret documents. Math classes include word problems on how to divide poison so that only the guests that one wishes to poison receive it in their dishes. When someone reports Sophronia’s wandering in restricted areas, she is punished because she: 1) got caught, and 2) admitted her guilt. The location of the school is also interesting. It is a dirigible constructed of three balloons fastened together, rendering the appearance of a caterpillar in the sky. Sophronia acquires a forbidden mechanimal, a metal, automated dog who runs on coal, just like the engines of the ship. She makes friends with the “sooties,” the boys who shovel coal in the engine room, when she sneaks in to gather bits of coal for Bumbersnoot. She also makes friends with several of the girls, and all of her acquaintances come in handy when she tries to foil a plot. One of the girls (or perhaps even a professor!) is trying to smuggle a new communication device to the flywaymen—or even worse, to the Picklemen! Sophronia and her friends are determined to thwart these enemies in the most fashionable and refined manner possible. If that doesn’t work, they’ll shoot them. Fans of Gail Carriger’s adult series, “The Parasol Protectorate,” will enjoy this teen-oriented steampunk adventure. They will also recognize younger versions of some of the same characters and get acquainted with the ancestors of others. Carriger continues to casually introduce werewolves and vampires to the story and still displays her absurd, arch sense of humor. Although Sophronia appears to be completely human, she is as much a fearless and lovable heroine as Alexia Tarabotti. Teens and adults will have fun with this one, which will be released in February. If you would like to read Gail Carriger’s adult series, the first title in the series is Soulless. Disclaimer: I read an advance reader copy of this title, provided by the publisher. All opinions are my own and do not reflect those of my employer or anyone else. Josie Moraine is the daughter of a brothel prostitute in 1950 New Orleans. She’s smart, pretty, resourceful, and desperate to escape her seedy life in Louisiana. She has many friends on the underside of society, including Willie, the madame of the house where her mother works, and Patrick, the boy whose father, Charlie, owns the bookstore where she is employed. Josie lives in the attic apartment over the bookstore, as she has since she was eleven years old and had to get away from her mother’s influence. Also known to her are the dangerous men in the Old Quarter: Marcello, the mob boss, and Cincinnati, her mother’s “boyfriend,” who repeatedly threatens her life. When society girl Charlotte comes into the bookshop and invites Josie and Patrick to her uncle’s house for a party, Josie begins to dream of joining Charlotte at Smith College in Massachusetts, even though being admitted or paying the tuition seems like just a dream. Life gets even more complicated when a wealthy man from Alabama, Forrest Hearne, buys books from her one afternoon and then winds up dead that evening, and Josie becomes entangled in a murder investigation. When she finds Hearne’s expensive watch under her mother’s bed, she hides it instead of turning it over to Willie immediately, as she should. Furthermore, Josie sees Charlotte’s uncle at Willie’s house and begins to blackmail him into writing her a letter of recommendation to Smith. The uncle is not easily cowed, however, and begins to demand more and more of Josie before he will write the letter. Although Josie is intelligent and well-read, she has grown up in an environment that has taught her to lie and to use other people to one’s advantage, even though she knows in her heart that it is wrong. Her relationship with her mother, who has absolutely no redeeming qualities, is so complex as to be infuriating to the reader. We understand why anyone would instinctively protect one’s mother, but as Josie is seriously hurt by her again and again, we want to see Josie triumph in life, just once. The anguish in the novel is excruciating at times, as Josie gets herself into some terrifying situations, and the author does not sweeten them up for a minute. Ruta Sepetys is the celebrated author of Between Shades of Gray, a novel about Stalin based on the lives of her grandparents from Lithuania. Between Shades of Gray made such an impression on me last year that I seriously believe it should be read by every teen and adult. We do not know nearly enough about Stalin, and Sepetys has a tale to tell. Out of the Easy is different. First of all, I don’t see that it is a teen novel. Although Josie is seventeen and eighteen at the time, her environment and situation are very adult. There are descriptions of the inner workings of a brothel that were more than I wanted to think about, and a younger teen, especially, may not even understand what is implied. Most of the characters are adults; even Patrick and bad boy Jesse are in their early twenties. It is a coming-of-age story, but there are many adult novels with this theme. All that being said, this was a very absorbing story of ambition, betrayal, and honor. Josie finds out who truly loves her and what in life is worth pursuing. All of the characters were richly portrayed, and the reader comes to care about so many of them and deeply despise others. The atmosphere of hot, humid New Orleans is a character in itself. At times, the tension is stretched like a wire, and Sepetys does not spare Josie the consequences of her decisions, nor does she soften the realities of underworld life. For adults and older teens, Josie’s dreams and struggles will stay with you for a long time. Out of the Easy will be published in February, 2013. Usual disclaimer: I read an advance reader copy of this title, provided by the publisher. Opinions expressed are my own and do not reflect those of my employer or anyone else. Aren’t they gorgeous? This is one of my favorite old family pictures. 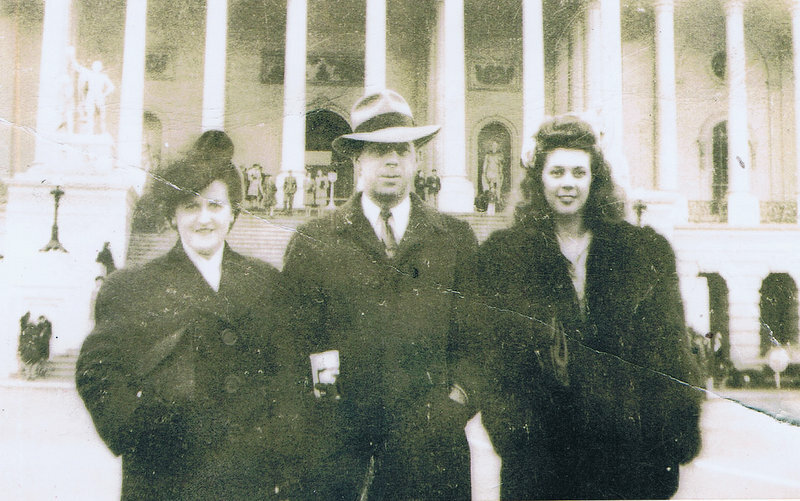 During World War II, my father was stationed somewhere near Washington, D.C., and his parents brought my mother to visit him on furlough. My father is on the other side of the camera. I love the hats and the hair. Although my grandfather was a railroad worker and my grandmother modeled “mature women’s fashions,” they managed to look glamorous on very little. My mother was probably still in high school at this time. She and my father married in December, 1944, when she was 17 and he was 19. She continued to go to school for her last semester, while he returned to the war. Dad came home in the summer of 1946, after the war was over. He worked full time at the village textile mill while he went to night school for six years at the Rhode Island School of Design, thanks to the G.I. Bill. In his spare time, he built a house. There were no power tools, so he cleared the land with an axe, mixed the concrete in a barrel, and cut the boards with a saw. My mother had had my older brother by this time, so she would push him three miles in a stroller every day to meet my dad and help out. In the winter, she put sled runners on the stroller so that they could get there even in deep snow. She proudly tells how Dad constructed the beautiful hardwood floor in the living room around a two-inch square of wood, working out in concentric squares from there. They worked so hard together to make their dreams come true. My dad died of Alzheimer’s Disease on January 4, 2004, after fourteen years of fighting a cruel devourer. My mother cared for him at home by herself until the very end, when the angels at Hospice came over every morning to help her bathe and change him. Mom is 85 now, still living alone, washing her floors on her hands and knees and raking up 90 trash bags of leaves and acorns this past autumn. She dreads the annual return of January 4th, not only because her husband died on that day, but also— through the years— her mother and her second son. Mom does her best to stay inside and watch happy movies. They are, indeed, the greatest generation. It’s depressing, but it must be done. We used to leave our Christmas decorations up until January 6th, but since I’ve been working full time, I like to get the house back to normal before I return to work after New Year’s. With football games playing in the background, my job this year included chiding, “That’s a terrible thing to say!” and “Do you mind?” at appropriate intervals as the two guys yelled at the TV. The Pack still lost miserably. I started in the kitchen, carefully boxing up the Christmas dishes— some of which we actually used this year! David began in the dining room by packing up the nativity scene that his grandparents made eons ago, and when I went to polish the dining room table, the room resembled an explosion in a sawmill. 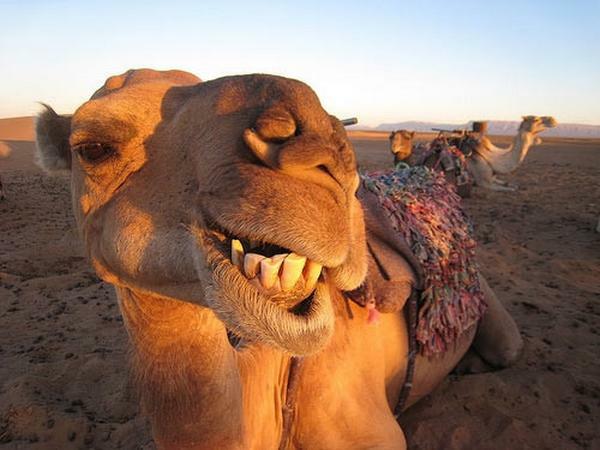 David immediately blamed it on the camels. Filthy beasts. Michael was tall enough to reach the top of the tree, even working around the treadmill, so he pulled off ornaments, garland, and lights while we all stowed them in the proper containers. There was a suspicious amount of bubble wrap left over, which makes me think that there are breakable objects hiding somewhere. Oh, like this glass Christmas tree on my desk. Oops. 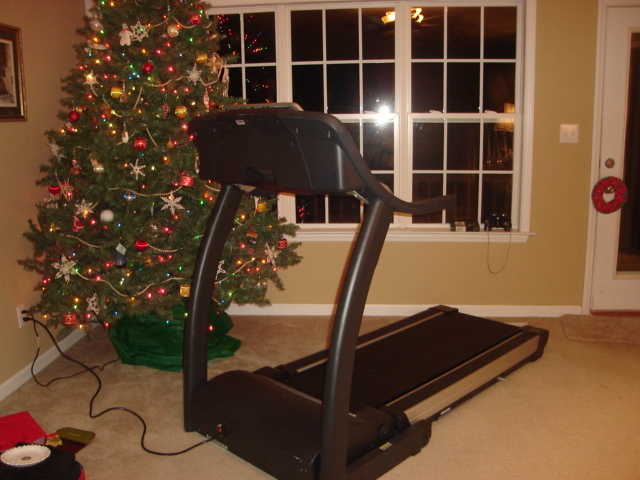 The downstairs is now clear of all decoration, green needles vacuumed off the rug, sawdust swept off the dining room table and floor, and even the treadmill cleaned. 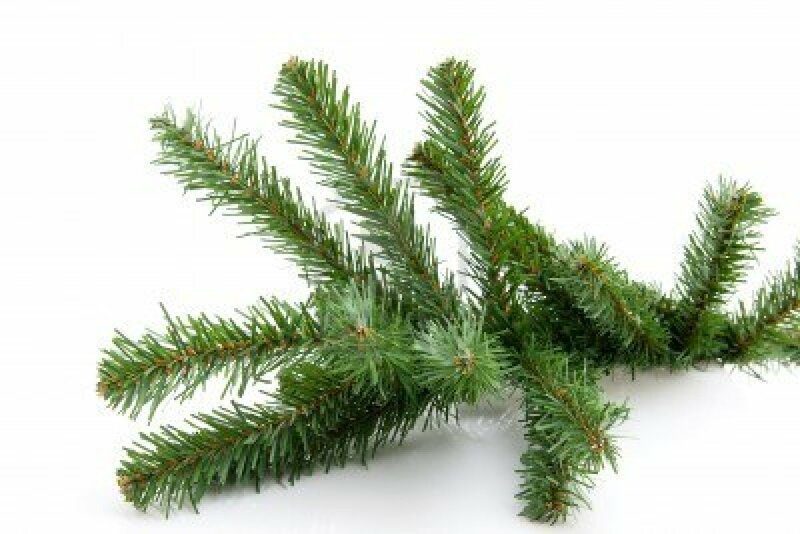 Now all that remains, David says, is to take the Christmas throw rugs to the carwash for their annual cleaning. Sometimes, I just don’t ask questions.